October 26, 2016 – Gen. John W. Raymond replaced Gen. John E. Hyten as commander of U.S. Air Force Space Command during a ceremony at Peterson Air Force Base, Colorado, on October 25. 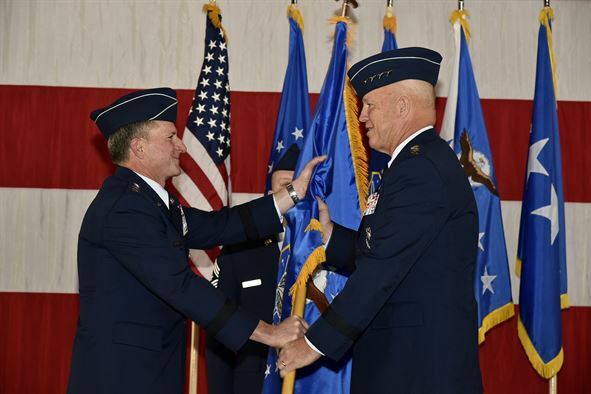 Air Force Chief of Staff Gen. David L. Goldfein presided over the change of command ceremony. Hyten will now head to Offutt Air Force Base, Nebraska, as the next commander of the U.S. Strategic Command (USSTRATCOM). Hyten will support USSTRATCOM with its global missions in strategic deterrence, space operations, joint electronic warfare, global strike and missile defense. He succeeds Adm. Cecil Haney. At the change of command ceremony, Goldfein spoke of Hyten’s progressive vision for the domains of space and cyberspace, calling his experience vital as he takes the helm of the nation’s strategic capabilities. Goldfein commended Hyten for his dedication, innovation, and leadership and welcomed Raymond to the command. “General Hyten is nothing short of a pioneer, much like Hap Arnold, Chuck Horner, and Bernie Schriever – leaders with extraterrestrial vision,” said Goldfein. As Commander of U.S. Air Force Space Command, Raymond will be responsible for organizing, equipping, training and maintaining mission-ready space and cyberspace forces and capabilities for North American Aerospace Defense Command, U.S. Strategic Command and other combatant commands around the world. He will oversee Air Force network operations; manage a global network of satellite command and control, communications, missile warning and space launch facilities; and be responsible for space system development and acquisition. The command comprises approximately 40,000 space and cyberspace professionals assigned to 134 locations worldwide. Raymond stressed his appreciation for Hyten’s vision and promised his unwavering commitment to continue to push the boundaries in space and cyberspace and advance the operational skill sets of AFSPC Airmen. The vast majority of Raymond’s career has been focused on integrating space into the joint environment, and bringing space and cyberspace to the forefront of joint operations. Raymond graduated in 1984 with a bachelor’s degree in administrative management from Clemson University where he was commissioned through the ROTC program. He also earned a master’s degree in the same subject from Central Michigan University. Since 2007, the general has commanded the 30th Operations Group at Vandenberg AFB, the 21st Space Wing at Peterson AFB, the 14th Air Force and led the Joint Functional Component Command for space for USSTRATCOM. Raymond revisits his space background after serving as the Deputy Chief of Staff for Operations at Headquarters U.S. Air Force, Washington, D.C. His responsibilities included being responsible to the Secretary of the Air Force and the Chief of Staff for crafting operational policy; which includes air, space, and cyberspace.